Abstract: This paper discusses the use of EMDR (Eye Movement Desensitization and Reprocessing) in addictions. Addictions have become a major public health problem impacting millions of individuals and their families. Although the etiology of addiction is multi-factorial clinical evidence shows that frequently the addictions are associated with concurrent mental health problem such as PTSD, or depression. Treating these concurrent conditions would help to reduce the negative impact of addictions. EMDR has been proven effective in the treatment of PTSD and Depression. Therefore EMDR can be used as one of the effective supportive therapies in addictions. Recent researches too support the effectiveness of using EMDR in the treatment of addictions. Further research is warranted to understand the total therapeutic impact of EMDR in treating addictions. An important characteristic of addiction is its stubborn persistence (McLellan et al., 2000). It has recurrent cycles of relapse and remission. Although addiction usually (but not always) begins with a conscious decision to use a drug, changes that occur in the brain at some point can turn drug use and then abuse into a chronic, relapsing illness (Wasilow-Mueller et al., 2001). According to Hyman (2005) the goals of the addicted person become narrowed to obtaining, using, and recovering from drugs, despite failure in life roles, medical illness, risk of incarceration, and other problems. There is a large and growing body of evidence about the neurobiologic basis for addiction behaviours, the role of genetic, environmental and epidemiologic factors. This evidence demonstrates that substance use is not a simple matter of choice (Stanbrook , 2012). Addictions and psychological trauma are highly correlated. The comorbidity between addiction and psychological trauma has been discussed by numerous researchers. According to Jacobsen, Southwick, and Kosten (2001) 22%–43% of people living with PTSD have a lifetime prevalence rate of substance use disorders. Based on an Australian national survey Mills and colleagues (2006) were of the view that alcohol was the most common substance of misuse by the survivors with PTSD who had a comorbid substance use disorder. PTSD was most prevalent among those using opioids (Ahmed, 2007). Among the psychological interventions EMDR remain as one of the effective therapies. A relatively small but growing body of literature indicates that EMDR may be an effective adjunctive treatment for substance abuse (Abel & O'Brien, 2010). Zweben and Yeary (2006) reported on the potential uses of EMDR in addictions treatment. When combined with traditional addictions treatment approaches, EMDR can enhance client stability, prevent relapse, and promote recovery (O'Brien, & Abel, 2011). Hase and colleagues (2008) reported a randomized controlled study which investigated the effects of eye movement desensitization and reprocessing (EMDR) in the treatment of alcohol dependency. As they report: thirty-four patients with chronic alcohol dependency were randomly assigned to one of two treatment conditions: treatment as usual (TAU) or TAU plus two sessions of EMDR (TAU+EMDR). The craving for alcohol was measured by the Obsessive–Compulsive Drinking Scale (OCDS) pre-, post-, and 1 month after treatment. The TAU+EMDR group showed a significant reduction in craving posttreatment and 1 month after treatment, whereas TAU did not. Their results indicated that EMDR might be a useful approach for the treatment of addiction memory and associated symptoms of craving. 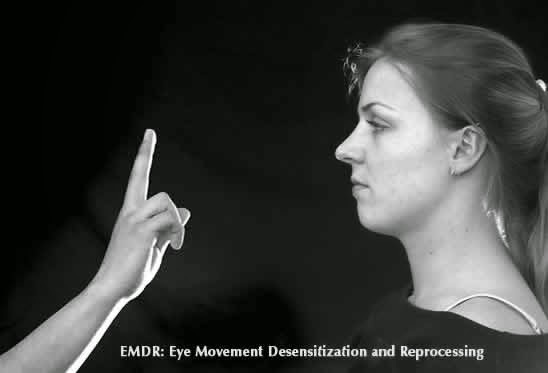 The mechanism of EMDR has become a central topic. According to Solomon and Shapiro (2008) the Adaptive Information Processing model proposes that the mechanism of action in EMDR is “the assimilation of adaptive information found in other memory networks linking into the network holding the previously isolated disturbing event”. Based on this assumption Schubert and Lee (2009) suggest that EMDR transmutes the dysfunctionally stored memory by integrating it with preexisting memory networks. Addiction memory plays a decisive role in addictions. The human brain is an open learning system, which reveals its own neuronal connectivity through the experience of the perceived environment with its own state; the personal addiction memory is interpreted as an individual acquired software disturbance in relation to selectively integrating "feedback loops" and "comparator systems" of neuronal information processing (Boening, 2001). Addiction memory has an effect on relapse occurrence and maintenance of learned addictive behavior. Abel, N. J., & O'Brien, J. M. (2010). EMDR treatment of comorbid PTSD and alcohol dependence: A case example. Journal of EMDR Practice and Research, 4(2), 50-59. doi:10.1891/1933-3196.4.2.50. Hase, M., Schallmayer, S., & Sack, M. (2008). EMDR reprocessing of the addiction memory: Pretreatment, posttreatment and 1-month follow-up. Journal of EMDR Practice and Research, 2(3), 170–179. Hyman, S. E. (2005). Addiction: A disease of learning and memory. American Journal of Psychiatry, 162, 1414—22. Jacobsen, L., Southwick, S., & Kosten, T. (2001). Substance use disorders in patients with post-traumatic stress disorder: A review of the literature. American Journal of Psychiatry, 158, 1184–1190. Marich, J. (2009). EMDR in the addiction continuing care process: Case study of a cross-addicted female’s treatment and recovery. Journal of EMDR Practice and Research, 3(2), 98–106. Mills, K. L., Teesson, M., Ross, J., et al (2006) Trauma, PTSD, and substance use disorders: findings from the Australian National Survey of Mental Health and Well-Being. American Journal of Psychiatry, 163, 652–658. O'Brien, J.M. & Abel, N.J. (2011) EMDR, Addictions, and the Stages of Change: A Road Map for Intervention. Journal of EMDR Practice and Research, 5(3), 121- 130. Quello, S. B., Brady, K. T., & Sonne, S. C. (2005). Mood disorders and substance use disorder: A complex comorbidity. Science & Practice Perspectives, 3, 13–21. Shapiro, F., Laliotis, D. (2010). "EMDR and the adaptive information processing model: Integrative treatment and case conceptualization". Clinical Social Work Journal 39 (2): 191–200. Silver, S.M., Rogers, S., Knipe, J., & Colelli. (2005). EMDR Therapy Following the 9/11 Terrorist Attacks: A CommunityEMDR Therapy Following the 9/11 Terrorist Attacks: A Community Based Intervention Project in New York City. International Journal of Stress Management, 12, 29-42. Solomon, R. M., Shapiro, F. (2008). EMDR and the adaptive information processing model. Journal of EMDR Practice and Research, 2, 315–325. Wasilow-Mueller, S., & Erickson, C. K. (2001). Drug abuse and dependency: Understanding gender differ-ences in etiology and management. Journal of the American Pharmacology Association, 41 , 78–90. WHO .(2004). Neuroscience of psychoactive substance use and dependence. Zweben, J., & Yeary, J. (2006). EMDR in the treatment of addiction. Journal of Chemical Dependency Treatment, 8(2), 115–127.